The books were bricks against my back as I walked down Annerley Road towards the ferry. It was early morning, winter, the kind of crisp Brisbane winter that made me curse the old Queenslander I lived in and praise the walk for warming me up. That semester, I had finally quit psychology to focus on literature and cultural studies instead. I didn’t know where it would take me, and couldn’t answer my parents when they asked questions about the future, but I knew that I loved studying literature, loved even the heft of the books in my bag – even the Norton anthology, with its thousand onionskin pages. At last I’d found something to commit to, something I adored. When I reached Dutton Park, I passed the cemetery and took the steep path down the slope towards the ferry stop. Sometimes when I trudged back up this hill in my Doc Martens, a man would be playing the saxophone in the dusk beneath a fig tree, his notes long and low like the light between the trees. The year before, my father had driven me down from Rockhampton to Brisbane so I could start an arts degree at the University of Queensland. The university, he called it. I’m taking Shelly down to the university, he told anyone who’d listen. Afterwards, when he climbed into his ute alone to drive back to Rocky, he left me with some extra money, a Refidex, and the startling realization that I was alone in this city. For quite a while, I didn’t know anyone at all in Brisbane who was older than 18. Now, approaching the river, I saw something surprising. A low fog sat on the water like a blanket. The tiny white ferry with the orange trim was waiting at the stop. My heart sank a little. Would the ferries be cancelled because of the fog? Would I miss class and have to lug my books back up the hill? As I reached the ferry stop, the captain, wearing his usual white, nautical hat and grin, signalled for me to come on board. I slid my coin over the counter to him and took a seat at the long bench that ran around the perimeter of the ferry. I always liked to look out at the water, but that morning, the water was hidden by the fog. Another first. There had been many firsts in the past eighteen months: my first lectures, my first scramble to register for tutorials by scrawling my name on sign-on sheets in the halls of the English Department, my first plate of food from the Hare Krishna market stall on Wednesdays. And throughout the winter and then the spring, I had fallen in love for the first time – an unrequited love that had led in the late summer to a night of shouts and tears in a St Lucia share house. That’s when I’d decided to take my wounded heart elsewhere, away from the western suburbs. And that’s how I had ended up in Annerley. Now the ferry driver started the motor and took us out on the river of fog, into the chalky whiteness. In my memory, it has the vivid strangeness of a dream. It’s funny that I should remember this moment so strongly, of all my UQ memories. Especially when there were so many more brilliant, more important days to come for me on that campus – days when I made some of the best friends I’ve ever had among the English Department postgrads, the day when I met my wife-to-be in a hallway in the Michie Building, the years spent writing a book about our marriage as part of my doctoral thesis, the day of my PhD graduation ceremony. I didn’t know it back then, at nineteen, but I would spend countless hours reading, writing, and learning at UQ, countless hours among the jacarandas and the sandstone. But that day on the ferry, the whole process was only just beginning, and I think that’s why the day stays with me. I couldn’t recognize the beauty in my own formlessness then, how lucky I was to have that time and those years, but I knew how to take in a moment like a breath, how to take it in and keep it. As the engine stopped on the final approach to the dock, we rode the soft curve in silence, the river of cloud beneath us. 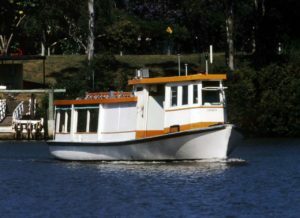 Pictured: Old Ferry, copyright of The University of Queensland. With thanks to The University of Queensland Archives for permission for use on this website. This entry was posted in Family and tagged Arts, ferry, First Day, firsts, fog, Friendship. Bookmark the permalink.